Join us to celebrate Bob Marley’s 70th birthday. Can you imagine the impact he would have had on the world if he had lived past his mid 30s? But his music lives on and continues to bring joy and awareness to young and old alike. 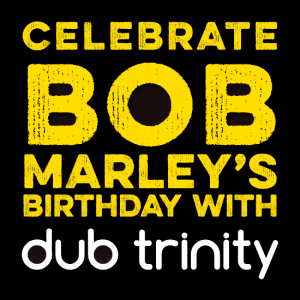 In that spirit, Dub Trinity will continue the tradition we started last year of doing a family-friendly matinee (kids get in free!) in addition to our rocking late night show. The matinee starts at 1:30 in the afternoon and the night show starts at 9:30 and runs till 1:30 am – it’s the 12 Hours Of Bob! Come join the celebration! One of the highlights of our year. Don’t miss it!